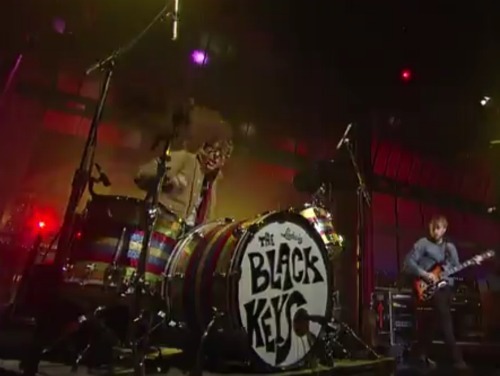 After a slightly icy interview on The Colbert Report Tuesday evening, The Black Keys‘ Dan Auerbach and Patrick Carney returned to late night on Wednesday for an electrified performance of “Gold on the Ceiling” on The Late Show with David Letterman. In under four minutes, Carney broke a devilish sweat, Auerbach yanked out a charming smile, and the two convinced enough Americans of a second single off El Camino. Not too shabby of a feat for their first press week. They’ll need it; after all, they’ve got plenty of arenas to fill in the months ahead. Check out the clip below, courtesy of The Audio Perv. El Camino is currently available everywhere.